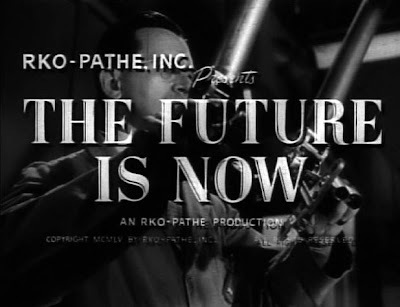 The 1955 short documentary The Future is Now showed viewers what technological changes they could expect in the near future. The clip below demonstrates home video, videophone and electronic music. What do you wear to answer the phone? What difference does it make? None, today! But tomorrow, if videophone comes, as well it might, then the world has found itself another problem. A special thanks to Jake over at the Paleo-Future Google Group for alerting us to the TCM airing of this paleo-futuristic classic. Neat! I actually have one of them electronic television camera things that takes moving pictures in black and white or colour, which I can then play back without processing. It's not as big as that guy's, though.